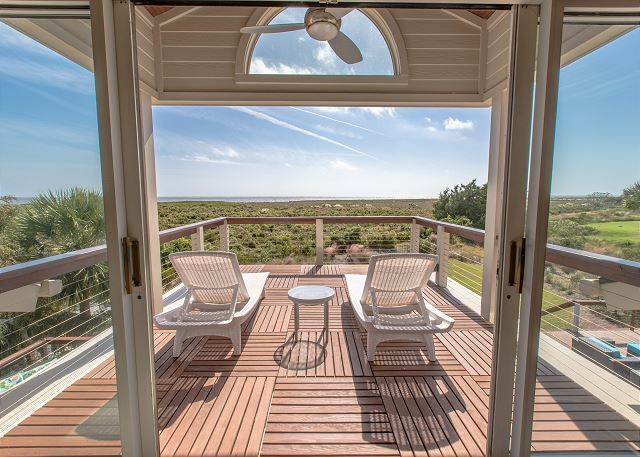 Your Seabrook Island vacation will be most memorable in this amazing beach house! 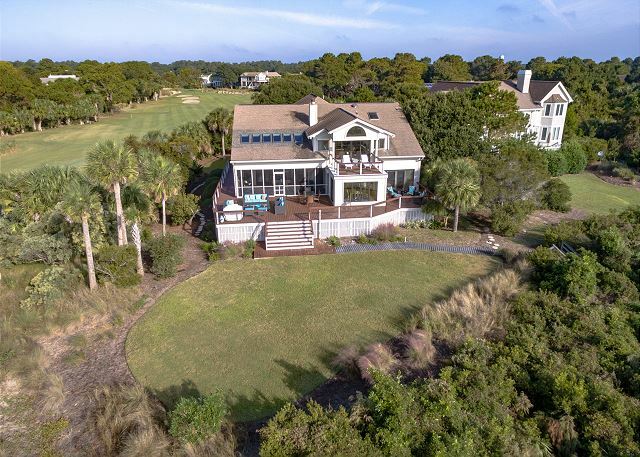 Enjoy our largest 5 bedroom home with ocean and golf views. 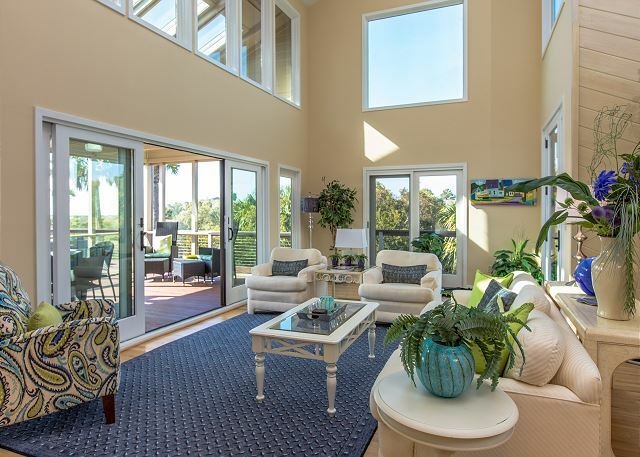 Guests may spread out in this spacious, oceanfront home with multiple living areas. 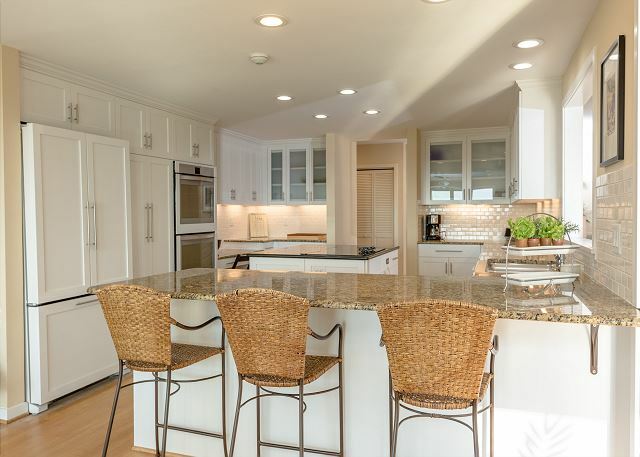 The kitchen was completely renovated in 2015 and features a center island, granite counter tops, upscale appliances and a variety of cookware and accessories to enjoy meal times and special celebrations together. The home's layout is perfect for multi generation families and individual families and friends traveling together. 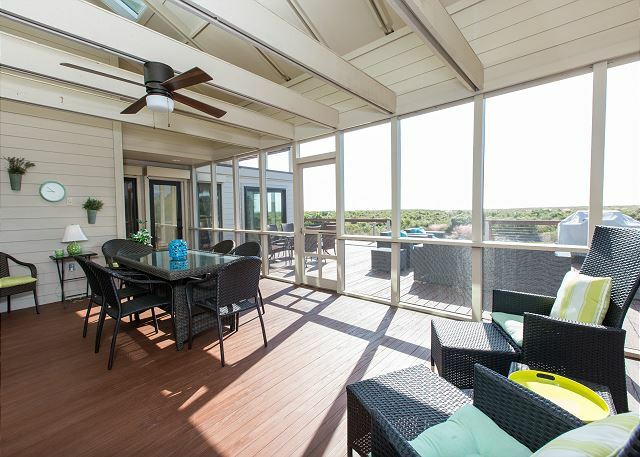 With three separate living areas, three large decks and a huge screened porch there are plenty of areas to relax and enjoy the Seabrook Island lifestyle! The master suite is large and luxurious! 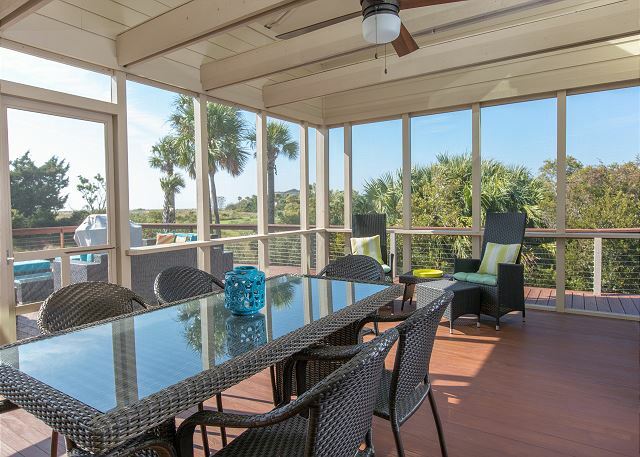 Take in the morning ocean breezes on the oceanside deck with expansive ocean views. Enjoy a private sitting area with sofa and flat screen TV. The high quality king bedding offers a great night's sleep after a fun filled day at the beach. Soak in the huge garden tub or grab a quick shower. The master bath also features a separate water closet, double vanity and make up table. The queen bedroom suite with private bath is also upstairs and offers a TV. The additional three bedrooms are on the main living level. An additional queen bedroom suite offers a full, private bath with tub/shower. Bedrooms four and five (twins and queen) share a full bath. All offer quality, comfortable bedding and are well appointed and coordinated! Walk directly to the beach from your private nature path, about a 4 min. walk) The home sits on a large, private lot. Home has a grill and outdoor shower too. You also enjoy free wireless internet service..
Our extended family has stayed in this home several times now for family reunions, and it's worked great for all of our crowd from age 18 months up to 78 years. Plenty of space to give everyone privacy when needed, and lots of wonderful entertainment areas (love the screened porch on this house!). One note is that the private Seascape boardwalk this year seemed in disrepair more than past years, we suspect due to hurricane damage. Please address this as some of our group started opting to walk down to Boardwalk 2 with smaller kids rather than brave our own private path to the beach. Otherwise we all love this house and appreciate the owners sharing it with us! Thanks! We have come to Seabrook off and on for the last 35 years and always look forward to our visit. We enjoy the house on Seascape because of the roominess and the fact it is on North Beach. We had 11 people with us and accommodations worked fine. The only downside is that when there are that many people, a larger refrigerator would be nice. We had to use a cooler to accommodate all of the food and drinks. This is the first year we have visited where it rained every day but we still managed to get beach time in every day. As usual, it was a great visit. This home was perfect for our annual family get together. It provided lots of space for the family to be together as well as areas for those who wanted some alone time. The view and beach access are the best. Everything went smoothly. The home was larger and more beautiful than we dared hope. We had a lot of comings and goings, but the spaces gave folks privacy as well as larger spots to gather. This home is great for multiple family groups. It is in an excellent location, off the main road and right on the beach. Great location, close to the beach. Great for family reunion. Space for gathering and for some alone time. This is the 3rd or 4th time we have rented this house and love staying here. We usually have 9-11 people in our group and the house is large enough to accommodate all easily. It is on the end of a cul de sac and very private with a private path to the beach. The amenities of the house are nice and if I had to mention one change it would be for a larger refrigerator. With the purchase of food for 10 people, the refrigerator could have been larger. 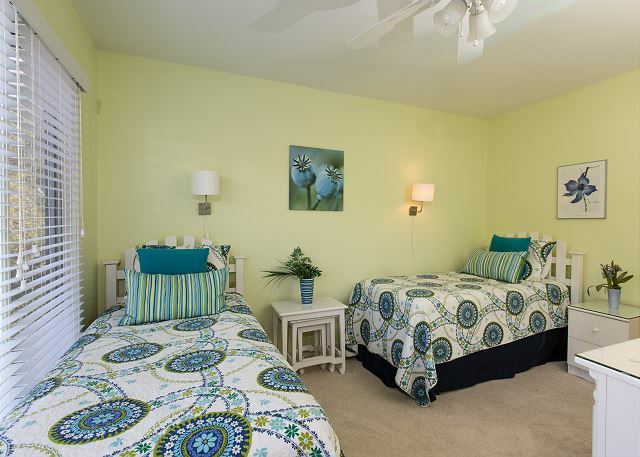 The master bedroom and private porch provide a beautiful view of the ocean and the private path opens to North Beach which is the best beach at Seabrook for boogie boarding. Am looking forward to our next stay. This is our second time renting this property. We are a big family, including grandchildren. This house works well with a big crowd. The path to the beach had been widen, which is of great help. At low tide there is plenty of beach!!! The kids rode their bikes to the pool, to get ice cream, and to take in the island and the wildlife. They always had a story to tell of what saw on their trail. Bunnies and deer were in the yard daily. Plenty of areas to fish on the island. We are mostly catch and release. Tidal pools were a big hit also. Our trip was a celebration of 40 years of marriage for us and three other couples. The property was a very enjoyable place for four couples to reconnect. The house had lots of areas to gather and a spacious kitchen/dining area for multiple cooks. We also enjoyed the privacy of the property and the short walk to the beach. Large lovely beachfront home, with views of the ocean (somewhat distant, but still very nice). 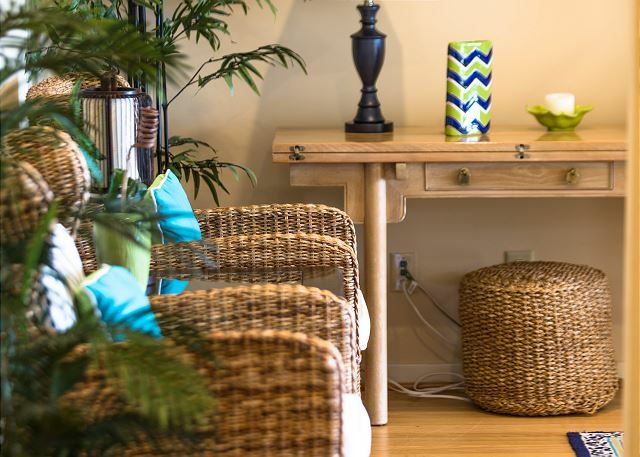 The house is beautifully outfitted and furnished, with plenty of room for our extended family to spread out. The kitchen made a great gathering place for communal cooking activities. The path to the beach was very nicely clipped back, which made the walk easier -- and the beach was beautiful, and virtually private; we had plenty of room to ourselves. This home is in an great location. It has many areas to congregate. It is a quick walk to the beach. 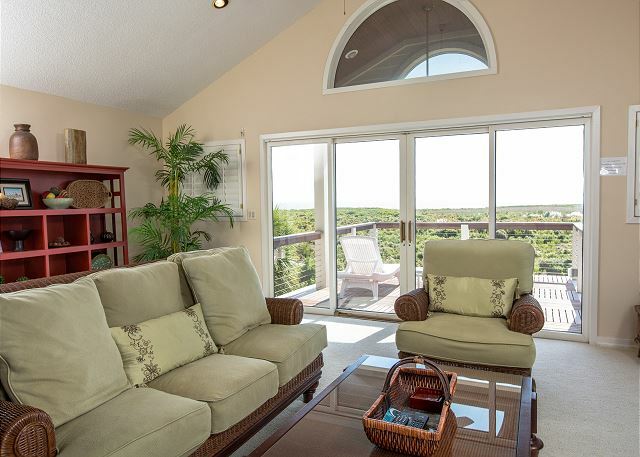 The deck and screened in porch are lovely areas for conversation and relaxing looking out at the ocean. This stunningly beautiful property is even bigger than the photos indicate. We spent a week with our adult married children and young grandchildren enjoying the uncrowded north beach and preparing evening meals in the large kitchen. Abundant screened-in porches and decks provided space for all the beach toys and chairs(provided) at days end. Outdoor shower and hose allow one to "de-sand." Sleeping at night is quiet, with only the sound of ocean, birds, and on one evening, thunder. Crabbing and fishing are very exciting,(small crowd gathers if you pull one in) and renting bikes to ride around Seabrook, with its live oaks covered in spanish moss, is an activity one should not miss. Loved this place and hope to return soon! very pleasant, nice house for large extended family. Everything was great! The house was spotless and well furnished. Top notch. All was as advertised. Only pleasant surprises! This is a large, comfortable family home if you want a place where you can dine together around a large table inside or out on a screened in porch. We love the private walk to the beach, the incredible view from the 2nd floor, the nearness to the Beach club. 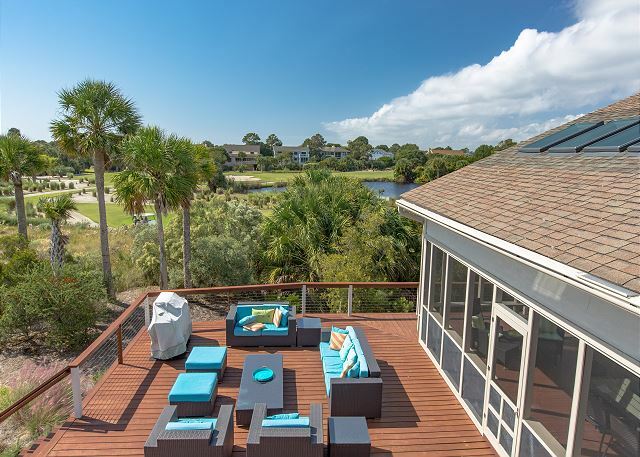 You can be as active as you want (biking, hiking, kayaking, swimming, sunning on the beach, visiting Charleston, dining out) or as relaxed as you want ( games and puzzles, watching the oceanfront, yoga on the smaller deck, reading). 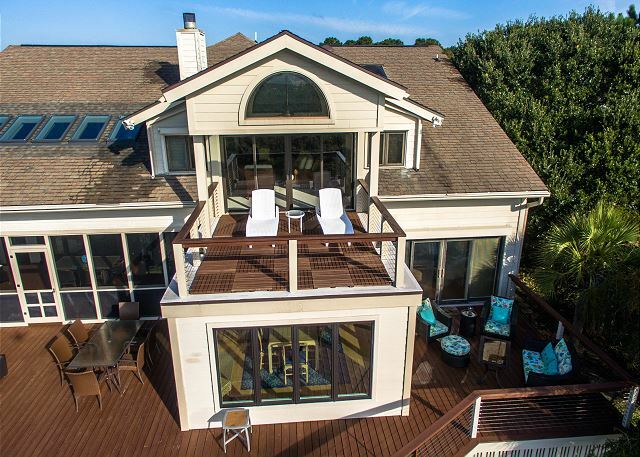 This house has many amenities to create the perfect vacation for a larger family. After 3 visits to this house it has become our home of choice for our bi-annual family beach vacation! spacious, comfortable with excellent location. The only thing missing was being stocked with games/puzzles but we brought our own. The sauna didn't seem to work (there was a chilly day!). Overall, a beautiful home--I would stay here again. The master suite was amazing!! Wonderful house for a large family gathering! This house was more then big enough for all 11 of us! We cooked large meals in the well stocked kitchen. The bedrooms were very nice with comfortable bedding. The master bedroom is huge! We all enjoyed coffee on the deck in the morning- watching the deer roam around the yard. In the evening we would have cocktails and watch the golfers out on the course. The path to the beach was well maintained and the beach itself is large and un-crowded. The house has are several beach chairs and toys in the storage room off the screened in porch. We would definitely rent this property again! Since it does allow for large gatherings a second refrigerator or undercounter drink frig would be a real plus! We had a wonderful time at Seabrook Island. The house easily met our family needs for space. 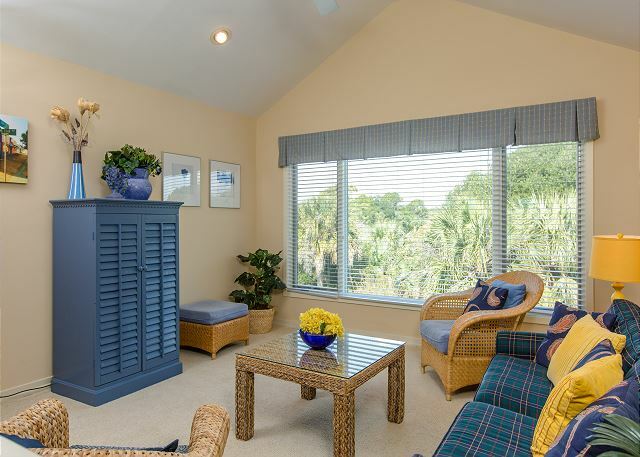 Location was excellent with easy 200 yard walk to the beach and other amenities. The grandchildren enjoyed seeing the deer every morning going across back yard. Harrington staff members (Kathy, Betsy, Susan, etc.) very helpful and informative. House was in reasonably good condition. Good instructions for renters around the house. After our vortex winter this was the perfect spot to welcome spring. Each sunrise and moonrise was different and we had the catbird seat for both from the deck of our master suite. one family of 6 and two sets of grandparents fit very comfortably in the kitchen, dining room and all the sitting spaces , plus we all had our own oasis to retire to. Our family gathered from all over the US for a great week in Seabrook at this lovely home. Everyone enjoyed their stay very much! We had a wonderful stay. The rooms are perfectly spread out for families. There was plenty of space all around. The kitchen is overall pretty well stocked. The fridge is rather small and the dishwasher could be updated. Walking to the beach was rather adventurous, (@7min walk) but didn't detour us from going every day. We would come back in a heartbeat. This is the 4th time we have stayed at this house and we love it. There are 9 of us and this house has plenty of space. They have upgrades the deck area since we were here last and it is very spacious besides being beautiful. 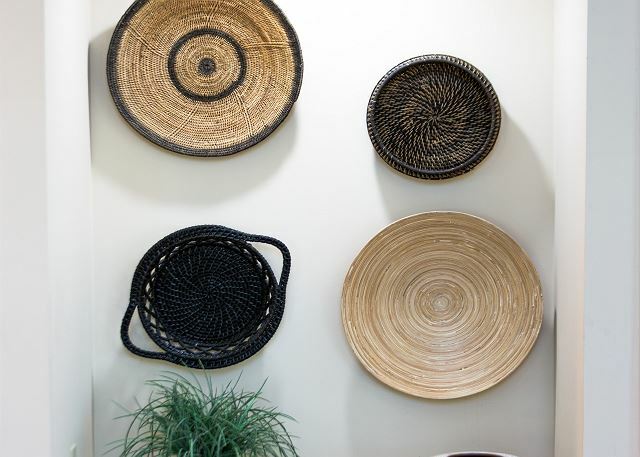 There are several areas if anyone wants private time and the decorating is also beautiful. The only recommendation I would make is that several of the TVs are still the old fashion boxes which don't have HDMI connections for gaming which the kids like to do in the evening. At least one of two of these should be upgraded, especially the one on the second floor den area. We have been bringing our family to Seabrook since the early '90s and this was our first trip with them as adults. Two spouses and our first grandchild joined us for this "perfect" vacation. The house accommodated all of us (8 altogether) very well. There were several "living spaces" so we never felt as if we were on top of each other. From the moment I booked our stay for a week at Seabrook Island my communication with Pam Harrington Exclusives was prompt, professional and courteous. We have stayed at 2281 Seascape many times now and it suits our large family so well. The location if perfect: semi-private backyard with great views of part of the golf course, wildlife (bunnies, deer, birds), and of course that magnificent ocean! After a short(8 minute) nature walk to the beach we relax and enjoy the sun, sand and waves on most days. The short beach walk or bike ride to the Beach Club gives us some time at the pool as well. This home is spectacular for it's ability to spend quantity, quality time together. Our family enjoys the space in this lovely home to cook together, eat together on the screened-in deck or around the dining room table, and star-gaze on the newly remodeled and furnished decking! This property has always been well-maintained, exceptionally clean and well furnished. What a treasure to be together in this blessed place! We had a wonderful holiday at 2281 Seascape with a blended family group of 8 with children's ages from 11-23. The house presented plenty of "escape room" for all while also having great communal space for meals together. The views to the ocean were spectacular and we all miss watching the pelicans fly over now we are back home. The walk/pathway to the beach was about 0.19 mile and somewhat difficult for my mother of 74 years (arthritis) but was okay for the rest of us. Overall, they house was as advertised and accommodated our family (6) well. Awesome Vacation! We love Seabrook Island! This spacious and beautiful 5 bedroom home was perfect for our family of ten. We had plenty of sleeping space and the eat-in dining room as well as the screened in porch were wonderful for large meals together. The kitchen was well-stocked. The path for the 5 minute walk to the beach was cleared and easy to traverse. We would love to make this an annual family vacation week!
" Redonkulous " as my 14 year old said. We spent a fabulous 7 days at house for a family vacation around a wedding. The location was perfect. View of ocean, though at a distance, was great. Nights on the screened-in were heavenly. Would have preferred one more set of twins than 3 queens but that's just because of the group we had. This is a great family or multi-family house. stay at this residence) The left front burner on the cooktop was not functioning and the dishwasher only worked on the quick wash cycle. The staff at Seabrook Exclusives could not have been more helpful or courteous. The home we rented was lovely. Thanks for the use of great towels! I know it sounds silly but it was so nice to not be stuck with the cheap thin bath towels that so many rental companies provide. We would gladly recommend your company to friends. Great house for families to share . Plenty of room for teenagers. Beach path needs marked at the ocean side in case you lose your way. Thanks. Fantastic beach house. Very large. Perfect location. 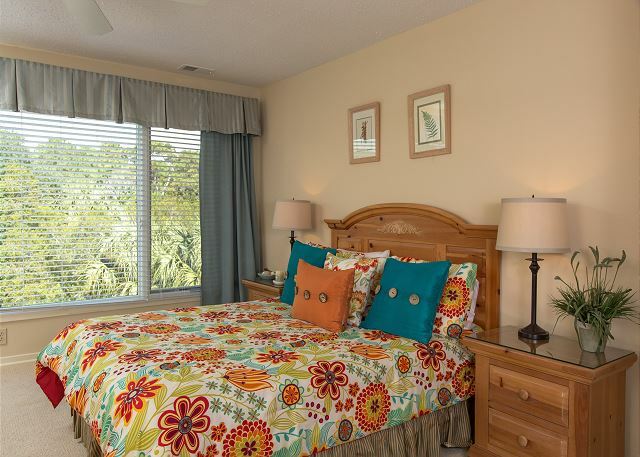 We have rented from Seabrook Exclusives more than a half dozen times and have always had a great experience. Highly recommended. I have one reservation about the property, and that was that it was advertised as beachfront. Although it was facing the beach, it was quite a walk to get there, especially with little kids and all their gear. All in all however, we had a lovely vacation. 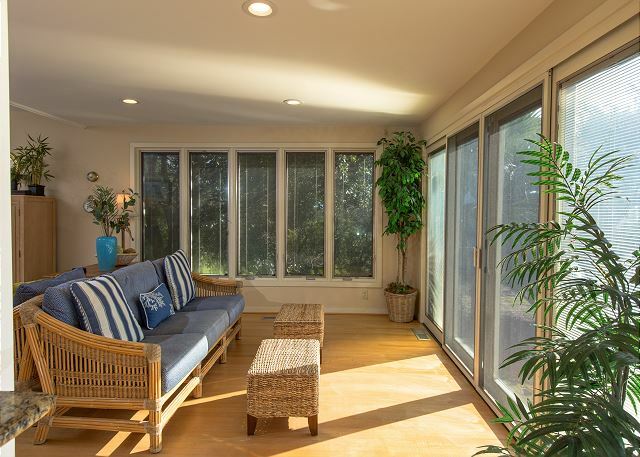 There is a stretch of natural foliage and sand dunes between the home and the actual ocean. It is a 5 minute walk down the private path. Thanks for your stay with us! Beautiful, well furnished home near the beach (a private 7 min. walk to beach that was an adventure for kids). 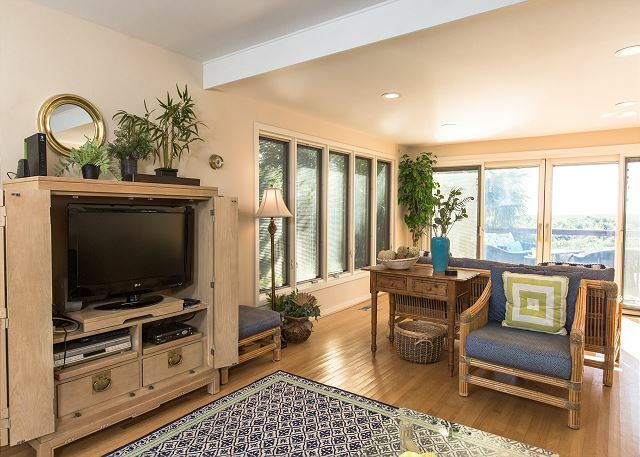 Three generations of our family enjoyed this spacious home with daily walks/bike rides to the beach. Great kitchen/dining area for family meals and board games. Loved the many private porch areas - the little ones had room to play while their parents,uncles and grandparents had their own private spaces. The Master Suite is delightful. 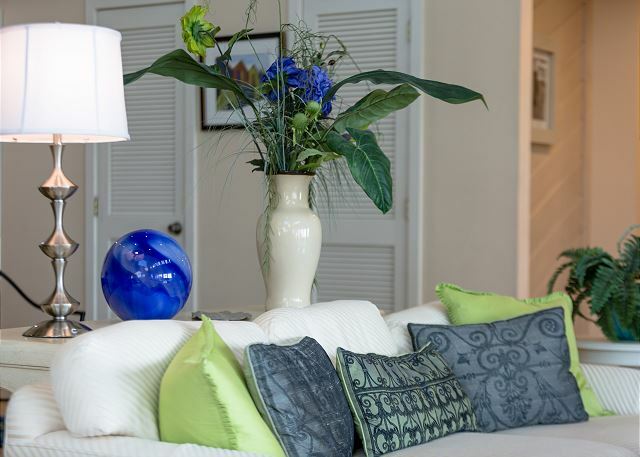 We have been coming to Seabrook every year for 30+ years and have stayed in a variety of homes. Everyone said that this home was perfect! Spacious recently redecorated home in some need of repair,and dishwasher, refrigerator inadequate for size of home - all outwieghed by location: private 5 min walk to beach with golf and beach club a short bike ride away - Seabrook Exclusives was the most responsive rental management group I have ever dealt with! Thanks Mrs. Barrett, The new dishwasher has been on order for several weeks. The bisque color is holding up the delivery! It will be here for you next year!